This is a “special edition” of the Informant America blog. 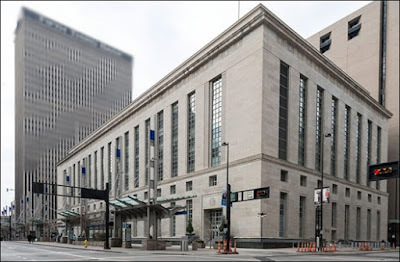 This week I submitted a sworn affidavit to the U.S. Sixth Circuit Court of Appeals in Cincinnati, Ohio regarding my detailed investigation into errors, distortions and outright lies in front of the Michigan Parole Board in Rick Wershe’s one and only parole hearing in 2003. I am working on a book about Rick Wershe and the “War on Drugs” and I have reviewed the court record in the Wershe case. Through considerable and persistent effort, I have obtained copies of the transcripts of the testimony, statements, legal motions and arguments on the court record in the Wershe drug case and I have conducted interviews with some of the key figures, including eyewitnesses. Some key figures are deceased. The U.S. 6th Court of Appeals Building-Cincinnati, Ohio. Rick Wershe's parole from a life prison sentence may be decided here. For those who don’t know, Wershe has a federal civil rights lawsuit going against the Michigan Parole Board for violation of his Eighth Amendment rights regarding cruel and unusual punishment. Ralph Musilli, Wershe’s attorney, argues it is unusual punishment to keep Wershe in prison serving a life term when the Parole Board has released every other Michigan prison inmate similarly charged. That is, they were juveniles when they were sentenced and their conviction involved a non-violent drug offense. That describes Rick Wershe. The Michigan Parole Board has released every prisoner incarcerated under those parameters; everyone except Richard J. Wershe, Jr. There was a lot of deception and mendacity in Wershe’s 2003 parole hearing but one of the striking elements was a letter submitted by then-Wayne County Prosecutor Mike Duggan who is now the Mayor of the City of Detroit. That letter is full of invective and hyperbole (nastiness and vigorous stretching of the truth) and it calls Rick Wershe “a menace to society.” The State of Michigan keeps including the Duggan letter in their filings with the federal courts as an attached exhibit to prove their side of the case. The letter has been cited several times by the Michigan Attorney General’s office in the Wershe civil rights lawsuit as “facts” the Parole Board relied upon. Thus, according to the Attorney General, the Parole Board gave Wershe a “fair” hearing. The Duggan letter is packed with falsehoods, misstatements of the court record in Wershe’s case and unsupportable claims masquerading as facts. I can prove it. I’m ready to do so. The judges and lawyers in this lawsuit keep arguing in never-ending circles about which established case law applies. Yet all sides seem to agree the issue is whether Wershe got a “fair” parole hearing. I contend he did not. And I contend the courts cannot resolve the matter without taking the time and trouble to re-visit the details of that 2003 hearing. So far, they have not. They cannot settle an issue of fact by arguing about the law. My affidavit urges the Court of Appeals to order a full inquiry regarding that parole hearing, complete with discovery, documents and witness testimony. My affidavit was sworn to before a notary public, which is standard practice. It tells the court I am making the statements in the affidavit under oath regarding the truthfulness of the contents. What follows is an exact copy. The actual notarized affidavit went to the court. No one asked me to do this. No one suggested it. In fact, it is highly unusual for a third party, particularly a reporter-type, to stick his nose in to an ongoing lawsuit. But in the Wershe saga I have traded my standard reporter coat and tie for the shirtsleeve garb of an old-fashioned muckraking crusading journalist of a century ago. That allows me to spout opinions and raise some hell. To follow is the affidavit in its entirety, exactly as it was submitted to the Court of Appeals. You can download a PDF copy here. You also can download a copy of the infamous Duggan letter to the Michigan Parole Board here. In Re: Richard J. Wershe, Jr. Michigan Department of Corrections Parole Hearing, March 27, 2003. 1. I am a reporter and television documentary producer/director with over 40 years of experience in print, radio and television journalism. 2. I have received some 20 professional awards for my work, including three (3) Emmys and the 1st Place award for best local TV news documentary at the New York and San Francisco International Film Festivals. 3. I was an on-air investigative reporter, anchor and special projects producer for WXYZ-TV and WJBK-TV, both in Detroit, Michigan from 1972 through 1996. 4. I am currently researching and writing a non-fiction book about what is known commonly as the War on Drugs, using the case of Richard J. Wershe, Jr. extensively as a focal point to illustrate various issues on the subject, particularly the use of confidential informants. 5. I have reviewed and researched the testimony, statements and documents submitted in the parole hearing for Richard J. Wershe, Jr. on March 27, 2003. 6. I have discovered serious errors and mischaracterizations presented to the Michigan Parole Board as fact in the 2003 parole hearing for Richard J. Wershe, Jr. Significant elements of the damaging testimony and documentation presented to the Parole Board during the Wershe hearing can be challenged and refuted through discovery and sworn testimony. 7. I have researched the allegations and accusations contained in a February 17, 2003 letter to the Michigan Parole Board purportedly written by then-Wayne County Prosecutor Michael Duggan in support of denial of a parole for Mr. Wershe. That letter has been cited by the Michigan Attorney General’s office in several filings with the U.S. District Court for the Western District of Michigan and with the U.S. 6th Circuit Court of Appeals. Through a spokesman, Mr. Duggan has stated that he has no recollection of writing the letter. Thus, there is a question as to whether someone else in the Wayne County Prosecutor’s Office wrote the letter and submitted it to the Michigan Parole Board under Mr. Duggan’s name. 8. The purported Duggan letter states: “When the police attempted to arrest him, he (Wershe) belligerently fought with the officers and assaulted them.” There was a scuffle, in fact there were several scuffles involving various individuals at the arrest scene, but Wershe was never charged with assaulting a police officer. In truth, after his arrest Mr. Wershe was not taken to jail but he was taken instead to a Detroit hospital for treatment of injuries, including a broken eye socket, sustained in a beating by Detroit Police officers while he was handcuffed, on the ground and in custody. 9. The purported Duggan letter states: “Wershe had 17.5 pounds or approximately 8 kilos of cocaine that was taken to the next door neighbor's house by David Golly, and placed under their porch.” This one sentence in the purported Duggan letter contains multiple errors and misstatements of the official court record in the Wershe case. Discovery and witness testimony would show Wershe never “had” the cocaine at the time of his arrest. There is no testimony that there was cocaine in the vehicle in which Mr. Wershe was a passenger when the vehicle was stopped by the police. Wershe’s fingerprints and palm prints were not on the box of cocaine confiscated by the police as part of his arrest. The court record clearly shows the box was not “…taken to the next door neighbor’s house…” Wershe was stopped by the police on Hampshire St. in Detroit. The 17.5 pounds of cocaine was later found under the porch of a home on Camden Ave., a block away from the police stop. Furthermore, a review of the testimony of David Golly in Mr. Wershe’s preliminary examination would show Mr. Golly never handled the box and never placed it under a porch. Mr. Golly spotted the box under the porch of a neighbor named Story—“I saw a box up under the porch”—and another man known as “Moosey” retrieved the box and brought it in the Story house—“Mr. Story asked him to bring it in the house...in to his son’s bedroom.” The preceding quotes are from the official preliminary exam court record. Mr. Golly observed certain events but did not handle the “box” as described in the purported Duggan letter to the Michigan Parole Board, nor did he see Wershe with the box at any time. The letter does not accurately reflect the official court record on this issue. 10. The purported Duggan letter states: "From the records, it appears that Wershe's gang and the police were contemporaneously looking for the cocaine up and down the street, both trying to find it first." There is nothing in the testimony in the Wershe case or in court documents to substantiate the statement that Wershe had a “gang” as the term is commonly used in law enforcement. No one has ever been charged as an associate or member of a Wershe “gang.” No Wershe “gang” member was arrested or detained or taken in to custody at the time of his arrest. 11. The purported Duggan letter states: “Wershe had the unmitigated gall and audacity to go right out again to engage in a drug deal involving 5 more kilos of cocaine.” The purported Duggan letter fails to inform the Parole Board that this case, which was filed some five months after Wershe’s May, 1987 arrest, was dismissed at the preliminary exam stage due to questions of possibly planted evidence and an improper search warrant. 14. The purported Duggan letter states: "Inmate Wershe is precisely the kind of drug dealer, gang leader, notorious violent kingpin that the over 650 g of controlled substances-lifer law was written for, and meant to punish." In truth, a fair and honest inquiry will show Wershe has never been tried or convicted for any violent crime. Furthermore, there is not a single shred of evidence to support the “kingpin” slur against Wershe. He has never been charged in federal or state court with conspiracy. He has never been charged with operating a continuing criminal enterprise. He has never been named as a co-conspirator or unindicted co-conspirator. His name was never mentioned during the course of any of the major drug trafficking trials in the federal and state criminal courts in Detroit or any other venue during the era when Mr. Wershe was on the streets. 15. The purported Duggan letter states: "Wershe's violent collateral crimes and the sheer volume of controlled substances that were introduced to the City of Detroit confirm that Wershe is a serious danger to the People of the City of Detroit and all of Southeastern Michigan, in particular." As I stated previously Wershe has never been arrested for, or charged with, any “violent collateral crimes” and in a full inquiry the Michigan Attorney General’s office and the Wayne County Prosecutor would be forced to admit this is a totally false accusation by the former Wayne County Prosecutor. 16. The purported Duggan letter states: "Wershe profited from the countless drug sales that his gang made, and the criminal enterprise that he built..." There are no court records—local or federal—to indicate Mr. Wershe had a gang that made “countless” drug sales and as noted previously Wershe has never been charged with operating or participating in a continuing criminal enterprise. 17. The purported Duggan letter states: "I have been contacted by many people including law enforcement officers from both the federal and state levels that are currently unwilling to publicly oppose Wershe's release for fear of retaliation against them, their families, and continue to be fearful that Wershe would even be considered for release." The only witness intimidation I have found in my inquiry into the Wershe 2003 parole hearing is alleged to have been perpetrated by police officers. I have not found any evidence to indicate the Michigan Parole Board made any effort to work with prosecutors to obtain confidential testimony from any implied intimidated witness, including law enforcement officers who allegedly fear for their safety and the safety of their families if they testify about Richard J. Wershe, Jr.
18. I submitted a Michigan Freedom of Information Act request to current Wayne County Prosecutor Kym Worthy on February 6, 2015, requesting copies of any and all documentation supporting the claims and assertions contained in the purported 2003 Duggan letter to the Michigan Parole board. In a response dated February 10, 2015, to my FOIA request for documentation supporting the purported Duggan letter, the Wayne County Prosecutor’s office advised me: "Your request is denied. After a diligent search for the records, we have determined and certify the records do not exist." 19. I have discovered in my research that some law enforcement documentation submitted at the Wershe 2003 parole hearing is, in some cases, highly misleading and in other cases false. For example, Drug Enforcement Administration (DEA) Special Agent Richard Crock submitted to the Parole Board a report of a statement from a confidential informant claiming Richard J. Wershe, Jr. sold weapons to an associate of the notorious Chambers Brothers drug gang. The Chambers Brothers gang was tried and convicted in federal court for the Eastern District of Michigan. Agent Crock neglected to tell the Parole Board that the DEA confidential informant—Terry Colbert—whose statement to the DEA was provided to the Michigan Parole Board during the Wershe 2003 parole hearing, was indicted and convicted by the U.S. Attorney’s office in Detroit for repeated perjury before a federal grand jury and at trial. (See 977 F.2d 203 No. 91-2057) Colbert was indicted, tried, convicted and sentenced on July 31, 1991 and DEA records indicate Agent Crock was fully aware of this fact at the time, yet failed to mention it to the Parole Board in 2003. 20. I have discovered in my research that another DEA investigative report submitted to the Michigan Parole Board in the 2003 Wershe hearing claims Roy Grisson, a Wershe associate, was shot and seriously wounded in an attempted murder ordered by Mr. Wershe. The DEA-6 report about Mr. Grisson indicates he supplied Agent Crock and other investigators with information about the drug activities of the so-called Wershe organization. In interviews, Mr. Grisson told me the shooting was the result of a plain armed robbery attempt and had nothing to do with Mr. Wershe. Furthermore, Mr. Grisson states he was kidnapped from the hospital by law enforcement officers as he was recovering from his wounds and taken to a suburban motel where he was “sweated” and “pressured” to make false statements against Wershe. When he refused Mr. Grisson states the police put him in a van and drove him to downtown Detroit where they “dumped” him in front of a retail store. Mr. Grisson has told me any statement in the DEA files purportedly signed by him is a false document with a forged signature and he is prepared to testify under oath to the truthfulness of this claim if called upon to do so. 21. I have noted in my research that with the exception of Special Agent Crock of the DEA, not one of the law enforcement officers testifying against Wershe’s parole ever had any contact with him in their police work. 22. I have read a sworn affidavit by William Rice, the former head of the Homicide unit of the Detroit Police Department, that he was ordered “through channels” to testify against Wershe. Rice further stated he was provided with Wershe’s federal grand jury testimony as part of a briefing binder to help him prepare to testify at the Wershe parole hearing. I have spoken directly with U.S. District Court Judge Avern Cohn of the Eastern District of Michigan who told me he has never unsealed Wershe’s federal grand jury testimony. Thus it would appear that someone committed a felony in releasing sealed federal grand jury testimony to prepare witnesses to testify against Richard J. Wershe, Jr. at the 2003 hearing. I have not been able to find any evidence this serious violation has ever been investigated. 23. I have noted in my research that three (3) Federal Bureau of Investigation (FBI) agents testified in favor of Wershe’s parole while two (2) Drug Enforcement Administration (DEA) agents testified against his parole, yet the Michigan Parole Board asked no questions and made no effort to reconcile this direct contradiction between the views of federal law enforcement agents regarding the advisability of parole for Wershe. · “Does it make any sense to think a white teenager was giving drug trafficking orders to violent adult black men with prison records? I make this affidavit on my own volition without any remuneration or promises from anyone. If called to testify I would state under oath that the foregoing information is true and correct to the best of my knowledge.